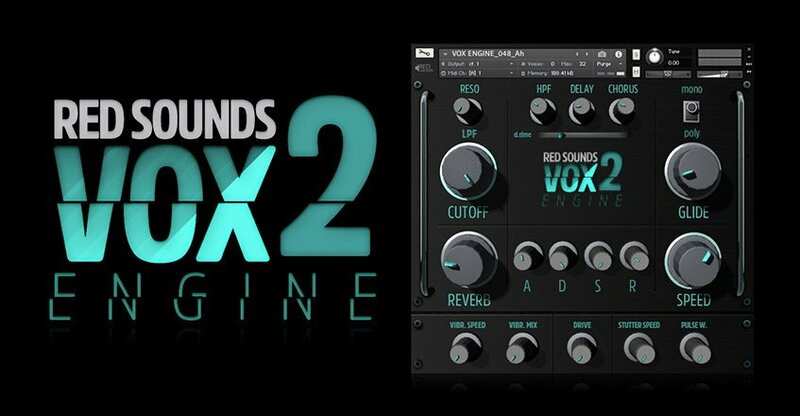 Vox Engine 2 is the new version of the Red Sound’s best selling vocal library for Kontakt that now includes more sounds, new effects and a new clean and easy to use GUI design. Vox Engine 2 is a vocal instrument for the full version of Kontakt 5 based on vocal samples made by studio singers and captured through two microphones to make them sound more 3D. These vocal chop samples can be used to make awesome new tracks and new musical projects, but also to add textures and chord progressions in any electronic music through the various controls included. Vox Engine 2 comes with a brand new graphical interface, a polyphonic mode for playing chords, and over 130 presets. In addition to ADSR controls, high-pass and low-pass filters, sample speed, glide / portamento, legato / mono switch, distortion, reverb and combis effects, Red Sounds added to this release a vibrato that you can control the speed, a stutter effect with speed and width settings, a delay whose level and time are adjustable, and a chorus. Most of the vocals were recorded with 2 professional microphones to make them sound more 3Dmentional. Vox Engine 2 for Kontakt (Full Version) is available for $30 in our store for instant download.